What are your Christmas and Thanksgiving traditions? My family and I have tweaked our holiday feasts to incorporate the traditional, primitive skills that we've learned out on our wilderness homestead. For instance, we harvest our meats each fall during hunting season — and there's nothing better than wild turkey or roast moose! For dessert we enjoyed a dairy-free pumpkin pie along with vanilla goat milk ice cream — freshly churned in our antique hand-crank ice cream maker! Preheat oven to 450 degrees Fahrenheit. Line a cast iron skillet with raw bacon. Combine the rest of the ingredients in a mixing bowl. Pour the cornbread batter on top of the bacon. Bake until the top is golden brown. 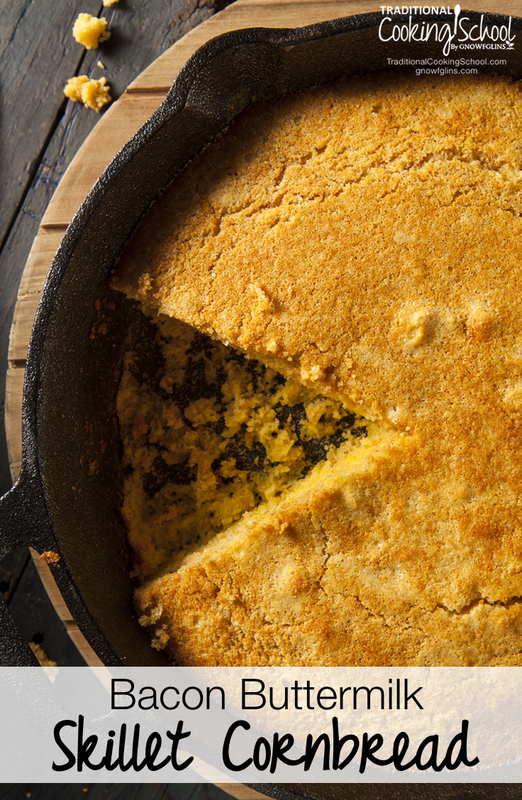 Will you try this bacon buttermilk skillet cornbread? 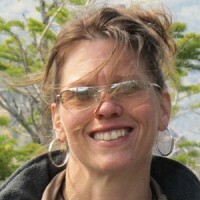 Tammy is a Christian, freelance writer, soon to be author, radio show host on the Survival Mom Radio Network, web designer, pioneer, homesteader, avid outdoorswoman, huntress, frugally self sufficient, Momma of two beautiful children, homeschool teacher and advocate for one amazing young Mountain Boy with autism and aspergers, married to her best friend, her cowboy and Mountain Man of her dreams. She resides very traditionally off-grid in the northern Idaho wilderness. You can follow her wilderness adventures at TrayerWilderness.com and TammyTrayer.com. Tammy, that cornbread sounds amazing!! …and gluten free? Bonus!! But the WIN comes with the BACON! Thanks Patrick!! And I totally AGREE that anything with BACON wins!! The Mountain Man and I both grew up on home smoked meats and we just can’t go without! Blessings my friend! Oh … My … Goodness! That looks just …. oh, mercy me!!! A “most-fine” cornbread and bacon anytime table “fare” Tammy. This is close to the recipe handed down from 4 generations back to my grandmother back in the 1930s. Only difference was my people used a up to a 20″ across by 6+’deep cast iron frying skillet with a heavy rimmed lid and buried it in a charcoal pit heaping coals on top. For a change they used deer strips and sprinkled cracklins on top after greasing with fatback lard useing deer strips instead of hog for a change. My people sre from the Sioux Nation of the Lakota, fine cooks all. You and yours be well , . Thank you SO much for reaching out and taking the time to share your story. I LOVE the stories of how our ancestors lived. We truly feel we were placed in the wrong era! 🙂 My husband used to take pack trips into the backcountry and did it all including the cooking so we often cook with our kettles and dutch ovens on the open fire as well as using the dutch oven as you described. I truly believe food tastes better in cast iron and on the open fire. There is nothing better than the smell of the fire and enjoying that 1st bite out in the open air. Using lard, game meats and the cracklins is something we enjoy doing as well. In a continuous effort to be more frugal and live more traditionally we are learning new skills daily. There is a great feeling to be had when you are using an old family recipe or an old tool or piece of cast iron – it just connects you to a different time. David I really enjoyed hearing from you and look forward to getting to know you. Blessings to you and yours my friend! This post caught my attention immediately! I’ve been reading the Little House on the Prairie Christmas Story anthologies to my children and have been thinking a lot about how things used to be. “Ma” would make some kind of little skillet cakes, a stew or roast in the pot over the fire and a few other special dishes from dried and stewed fruits. It’s pretty incredible what those prairie women and now modern mountain women like you can do in the wilderness 🙂 Keep it up! So glad you stopped by and took the time to comment. Isn’t it something to read those types of stories and especially to our children. To share that time and place is special. I have always enjoyed those stories too and to now be living those stories is awing to me! It is an era I feel very close too and one I feel I belong! The women of those times had such spirit and were just amazing to me! I am thankful that people are gaining something from the materials we share – we feel very driven by God to live this life and share it with others. It is extremely rewarding! I LOVE your 3 Christmas Cookie Recipe post on your blog and I have shared that just now in several places. We are very big on the healthy foods and I always love finding new gluten free recipes! So thank you as well. It was a pleasure to get to know you this morning and I look forward to connecting more. Blessings to you and yours! My goodness, this reminds me so much of my MaMaw! Thank you so much for sharing, and blessings to you and yours! Thanks Lynn!! You are very welcome. I have fond memories of my grandparent’s and I enjoy greatly the simple reminders of them so I am glad this was one of those simple reminders for you. Blessings as well to you and yours and may your New Year be very blessed! Hi! I do all my own baking from bread to cookies homemade, gluten free and low gluten for my step sons. I had been looking for a good buttermilk cornbread gluten free of course and found this one! Which looks amazing. I’m actually trying the recipe as I type! I have to apologize for such a delayed response to your comment, but I wanted to take the time to respond. I hope you enjoyed and if you ever need other gluten free recipes for your sons look me up. My son is on a 100% gluten free diet and I have adjusted ALL our recipes and have hundreds to share. I hope you enjoyed it is one of our favorites. I think this recipe sounds delicious! I can’t wait to try it and see if it tastes as good as it sounds. I love reading your pages, on FB & here. Keep us up to date on all your doings and let us learn from you what we need to know to live a cleaner, better life. I owe you an apology for such a delayed response, but I wanted to take the time to thank you SO much for you very kind words. It means the world to me and warms my heart to know that I am helping others. That is my goal and also a blessing to me to know that I am successfully doing so. I hope you have enjoyed this recipe and thank you for following our crazy adventures. Blessings to you and yours lovely lady! Tammy, after baking, do you remove the cornbread from skillet, or just serve sliced directly from the pan? I am such a frugal gal and try to simplify in everything I do so I actually serve this right from the skillet. If you would want to remove it from the skillet to serve it I would recommend really greasing the skillet well with lard or butter… Yummm…. I hope this helps and I hope you have enjoyed. How does the texture of this compare to modern recipes for cornbread that call for 1 cup cornmeal to 1-2 cups flour ?? I am SO sorry – I just noticed your comment and I greatly apologize. What you are referring to is more like a dessert bread – I have a sweet cornbread recipe that is out of this world that fits what you are describing. This bread is more of a solid, textured and tighter bread – more your traditional cornbread recipe. It is really great served fresh on a cold day with some hot soup. THANK YOU SO much for sharing this…. I read this to my husband and absolutely LOVED comments and especially your closing sentiments “I’ll take my bacon grease straight”!! Bacon grease and homemade butter are two things, no matter how healthy I am, that I will never give up!! So glad you are enjoying what you are reading here and again thank you for taking the time to comment – really enjoyed it!!! after raising five kids , I feel I could survive any thing .I can almost all our food , I have gathered nuts & wild herbs, pickled beets, cukes ,corn , etc.. made sauerkraut , smoked & rendered. Ive done it all . my family is raised now & I have nine grand kids , & six ggrand kids ..but when its in your blood you cannot stop doin it ….. Thanksgiving has always been out big holiday …Back when I was a kid my Mother never told us it was Christmas because she didn’t have any money to buy us presents … but we survived…. today its another world where kids get stuff they never even ask for … what a shame on their parents to allow this in the name of givin everything to their kids… & what a detachment there is today between kids & parents. Being poor made us stronger & we learned early the desire to work & the responsibility to be on time. Theres nothing worng with havin money & a good life if you can create a healthy balance….I say good luck to the youth of today … God help them if the convience stores went out of business, lost a cell phone or had no access to a computer….. sounds like your doing a good job teaching your family all they need to make it !! Good memories are a good thing. Hi Tammy, I have just found your site and am enjoying it very much!! I have been watching all of your videos on Youtub. You and your family really intrigue me. We live on 55 ac. in the foothills of No, California. We are truly blessed!! We raise our own beef cows and milk cows Right now I am milking only 2 cows but it will be up to three by this time next year. I make all our own dairy products and feel very blessed to have the strength to do this. Like you, I also try to make everything from scratch. And now this winter I have chosen to learn how to cook on our old fisher wood stove! I told the family get prepared and hang on while I accomplish this new task. All this to ask you if you could make this cornbread on the top of the wood stove and if so, how would you go about doing it? I so want to learn to bake bread,, biscuits, cookies, cakes, etc. on the wood stove. Any pointers you can hand down I would be very thankful for. I pray that you and yours have Blessed Thanksgiving.